Packed with technology, the new five-strong Opus2 loudspeaker range from legendary manufacturer Wharfedale is said to offer a scale of presentation beyond that possible from conventional high-quality speakers. Quite a claim, but all the new models do, however, sport proprietary carbon-fibre bass drivers with a clever tri-laminate cone, three-inch midrange units and a copper-coated aluminium tweeter to help deliver Wharfedale's promise. It's this very driver compliment, though, that's behind Wharfedale's bold claim. The company says that it's the volume of air capable of being displaced by the drivers, coupled with their speed of response that sets them apart from the competition. 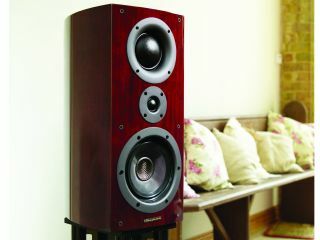 The speakers are said to have been designed for "exceptional accuracy" with the company aiming for a "lifelike listening experience akin to that of a live concert hall". The drivers are housed in a variable-density multi-layer laminate MDF cabinet, with a sealed and isolated mid-range compartment. The speakers also boast high-purity oxygen-free copper cable throughout and are available in a choice of real wood veneers with two finish options: piano or satin. The Opus 2 range includes two standmounts, the M1 and M2, plus three floorstanders, the 1,2 and 3.